Will not reproduce in freshwater, brackish only, but will make lots of small white eggs on roots and stones. This snail is a great algae eater. Generally will not touch plants and will eat most types of algae. 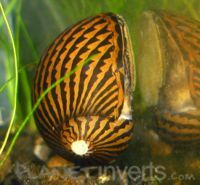 If no algae is present the snail will have to be supplemented with blanched vegetables and algae wafers. Will constantly graze in its environment. Needs a spacious well oxygenated tank with plenty of algae to eat. If put in a new tank with no algae present and not supplemented, it can starve. A tight fitting lid is a must, as these snails can be escape artists. If acclimated to full-strength saltwater, they can be housed in a marine setup. An attractive snail that will not multiply. They may lay eggs, but they will not hatch. Young need brackish, or saltwater to be successfully reared because the larvae need the saltwater's minerals to build up their shells; for that reason, you will have the most success rearing it in full-blown saltwater, and adults can thrive in brackish, and saltwater. A pretty rounded shell with a deep yellow base colour and dark brown stripes running down it towards the spire. Online Snail Shop based in Cornwall, UK. This page was last edited on 22 August 2018, at 01:47.